The students in Colombia are still struggling their battle for their rights to freedom, democracy and public education. They experience threats, assaults and corruption in their battle against paramilitary groups. The Colombian Student Organization ACEU was awarded the Student Peace Prize in their work for, amongst other things, document and systematize these conditions. They now hope that the Student Peace Price will enlighten their situation connected to a democratic election for students in Sucre. Ana Paola Romero received the Student Peace Prize in 2005 on behalf of ACEU. She is running for election as a student representative for the state university in Sucre. A student representative is an important role in the university, and therefore politicians want to control the position. Ana Paoli accuses her opponent to receive votes bought from corrupt politicians in exchange for the candidate´s loyalty. The administration manages the university´s resources after other interests than the students´, and ACEU works to defeat this administration. The politicians want to undermine the students´ engagement because they consider the students as oppositional against them. The politicians have also succeeded creating a picture through media, of the students as rebels and terrorists. 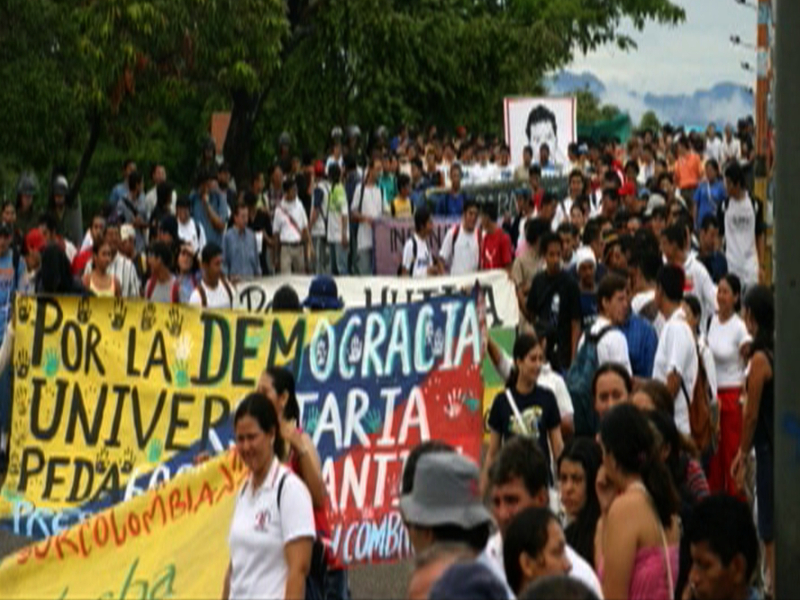 The paramilitary groups´ involvement in the area often leads to corrupt incidents in students´ democratic elections. ACEU and the students experience great challenges by participating in democratic elections when the government undermines their political views by calling them terrorists and rebels. Ana Paoli returned home with the Peace Prize, and was exposed to threats. Despite the threats, she decided to stay in Colombia and continue her work for the Colombian students´ rights. She wants the international world to see and help the students´ struggle in Colombia, and be aware of what happens. The Student Peace Prize wants to contribute with creating an international focus on the situation in Colombia by conveying her message, and show solidarity to the students´ battle for their rights.